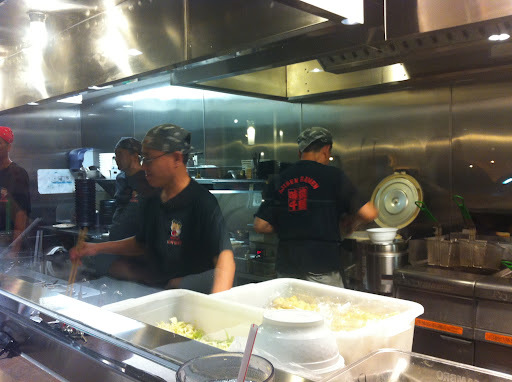 I recently acquired another newbie to be part of the ramen run blogs. Her name is Mariah. She is a ginger, (not the kind that go in my ramen bowl..) plays piano and sings at my church AND owns a collection of The Office bobbleheads. Not kidding. I have seen them with my very own eyes!!!! Mariah has heard of my epic ramen runs and wanted to have her first ramen run experience. 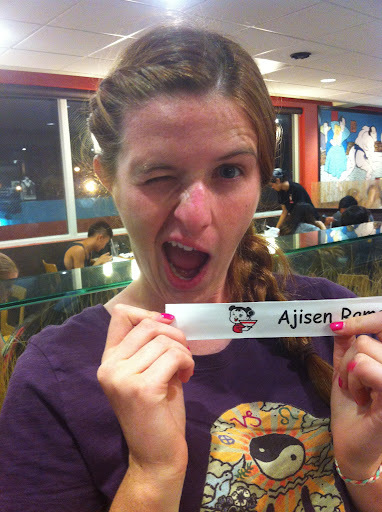 One Saturday evening, after selling CD’s with Matt (you know, that one guy that randomly appears in some of my blogs) I took Mariah on her first ramen run at Ajisen in Rowland Heights. 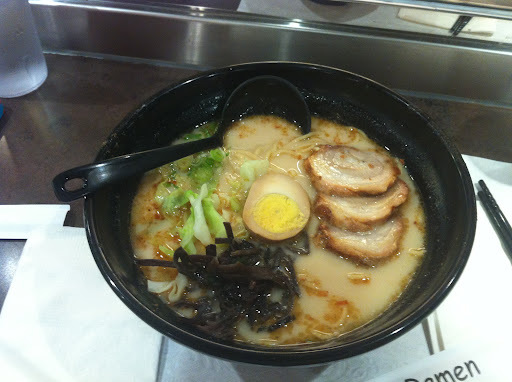 Yes, I know I’ve been here a lot, but the place has a variety of ramen broths and styles which is great for newbies. Matt somehow snuck into this blog again. By the way, check out his website for his new CD, The Great Unknown. You get to hear me play percussion on some of the tracks. When we arrived, there was a 20 minute wait. It was a Saturday evening, so it was bound to be packed. 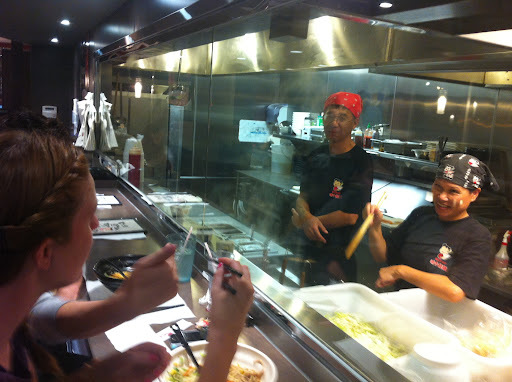 I was happy that we were seated at the bar area because Mariah was able to see the chefs cooking up the ramen! 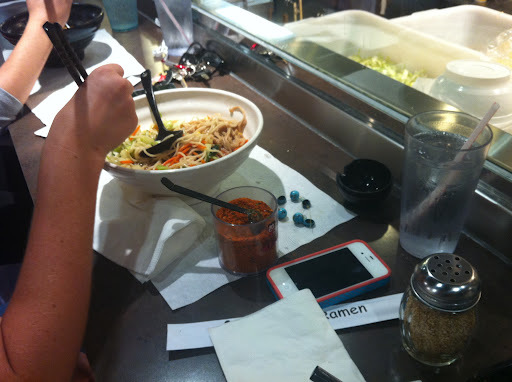 Ajisen was the perfect place to take Mariah on her first ramen experience. 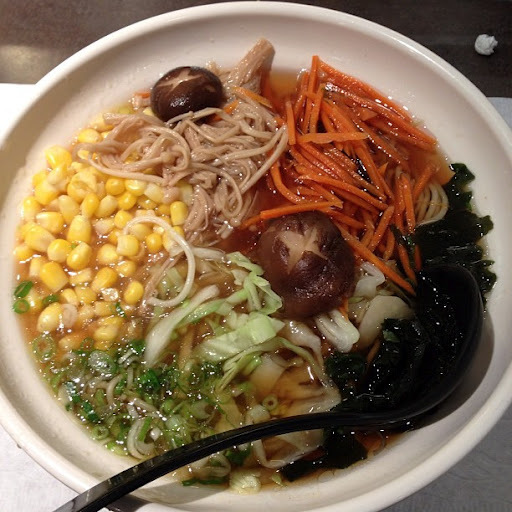 They offer different types of broths and toppings, such as kimchee or tomato, and flavors as odd as cheese ramen! 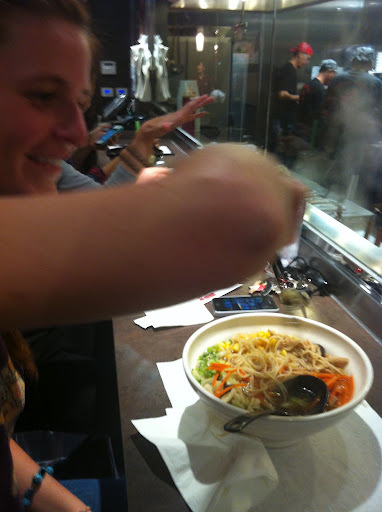 Mariah doesn’t eat pork or beef so she ordered the vegetarian ramen with shoyu broth. I ordered the Ajisen ramen and Matt ordered the spicy beef ramen… again. Attempting to get them in her hand.. There she goes with that arm thing again! The woman working in the kitchen was watching Mariah with a look of disapproval the whole time, as she figured out how to use chopsticks. She eventually gave up observing and just showed her how to do it. 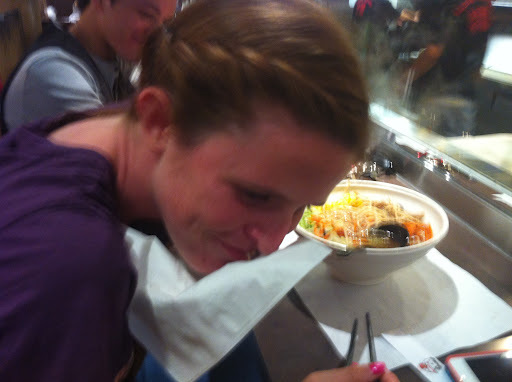 Even Matt and I learned a little trick to using chopsticks! (I wish I can explain it but I’m too lazy right now. 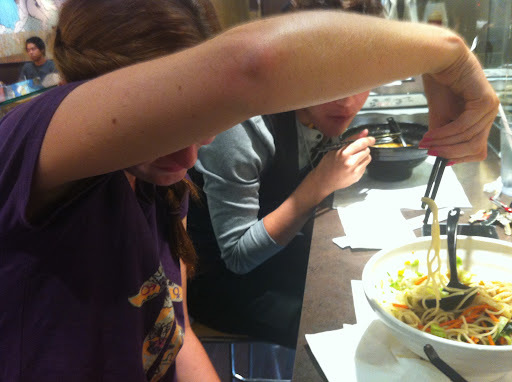 I’ll do so with a photo in the next blog) But I have to hand it to Mariah for trying, she refused to use a fork! I’m sure she’ll get it after a few more tries. That was a fun ramen run. 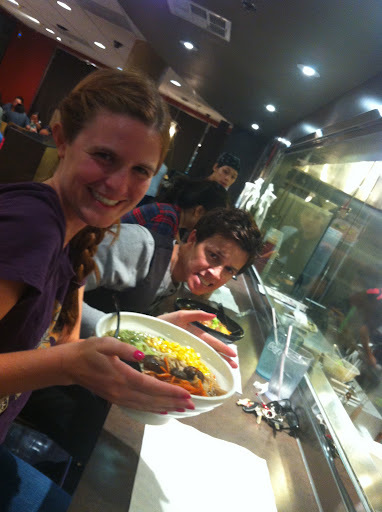 I always love taking friends on their first ramen run experience. 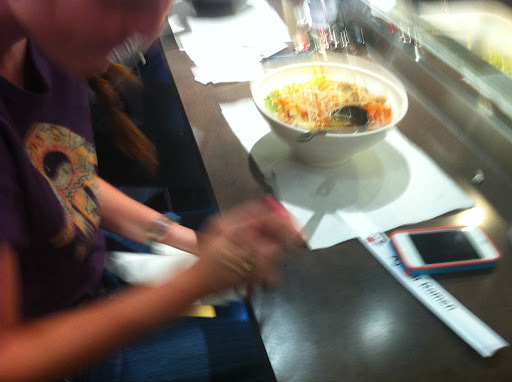 I hope Mariah liked the ramen! It’s too bad that Ajisen seemed to only have one type of vegetarian friendly (or non pork/beef) ramen. Now I need to find other places that offer other ramen varieties so people that can’t have pork broth, can enjoy the wonders of ramen! On a side note, I think I should stop calling new ramen eaters “ramen virgins.” Dangit… I just used it. Anyway, I was checking my blog stats to see how people find my blog and things like that. Most of them come from our links on Facebook, but the stats also show what people type in their search engines. Apparently, someone found our blogs by typing in “asian virgins.” Because they typed that in the search, they found our “Ramen Virgins” blog entries. Pervs… Anyway, I’m sure this blog might turn up the next time someone types in asian virgins.